On Thursday, September 26, 2013, women with diverse jobs on the James Webb Space Telescope answered questions about the female experience working on a NASA flagship mission in the TwoXChromosomes subreddit. You can go read the full thread and the interesting discussion it provoked, but we’ve pulled out the questions directly answered on this page. A: Amber: We are always thinking about what the next big thing will be! For the big survey we had in 2010, astronomers decided on the Wide-Field Infrared Survey Telescope (WFIRST); see: http://wfirst.gsfc.nasa.gov/ We're also thinking about really big future telescopes as well. There are lots of exciting things on the horizon!! A: Maggie: For me, it was not getting enough math early enough in high school. For whatever reasons, the way I was tracked, I didn't get calculus in high school, which meant I had to learn it in a 300-person university lecture hall. It wasn't easy. So for anyone looking at being a scientist or engineer (and I realize this answer might not apply to aggieastronaut who is past this point) is to get as much math as you can as early as you can, while you are still in a small classroom environment. You might not realize when you are young (I didn't!) that astronomy is all about math. 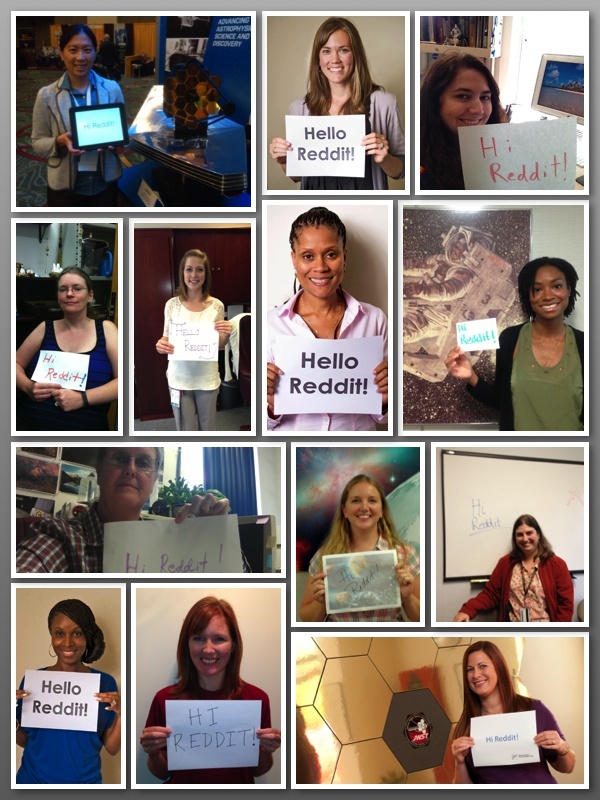 Stefanie M: Thanks for the questions aggieastronaut! As a planetary scientist, I am honored to be part of JWST as the Planetary Science Liaison and consider it one of my greatest triumphs in my career. My advice as an early career scientist is to work on establishing yourself in the community as an expert in your field through publications, presence/presenting at meetings, outreach, and organizing meetings/workshops. My background is in Chemistry, which makes my position somewhat unique. The only thing I would have done differently is to have taken more instrumentation classes in astrophysics. The greatest obstacle I have faced is turning opportunities down. If you are not careful you can quickly become overwhelmed. Congrats on your new appointment with Dawn and best of luck! Allison: Congratulations on your new position on Dawn! My advice is to get involved with as much as you can. Invite yourself to all meetings related to your program or your division that you can, even if they don't relate to your specific tasks. If people are talking about a problem they are working on - join the conversation. It is amazing what you can learn this way! If you see an area where someone needs help - volunteer! A: Pam: Without a doubt, I would have to say one of my favorite parts of working on JWST are the people. They are fun AND smart. However, nothing tops activities such as "REDDIT". Nothing gives me more joy than reaching out to the community about the work we do here at NASA. I love talking to kids, especially my nieces and nephews about the telescope. They find it quite fascinating and I love it when they get excited about technology. Christine: The JWST instruments are built by international teams of scientists. For example, MIRI was built by a collaboration of American and European astronomers. More than a dozen European countries contributed. Working with scientists from around the world have been both fun and educational! Maggie: Seeing how enthusiastic the people who work on it are. Everyone is genuinely excited about how cutting-edge the engineering is and the amazing science it's going to do. Amber: It's amazing to be working on the project that will be the scientific successor to my favorite current operational telescope: Hubble! Hubble has completely revolutionized the way we understand the universe. We are designing JWST to answer the biggest questions in astronomy that Hubble can't quite answer. I'm positive that we will discover things with this telescope that we haven't even dreamed of yet! So, the science is my favorite part. Julie: My favorite part of this project is to help my colleagues be successful in getting their hardware to operate as designed. Everyone is so passionate about their work and they are excited when it succeeds. For instance, we just received the NIRSpec instrument from Munich Germany this past Friday. The team from Germany arrived in their traditional lederhosen! They are so happy to see their instrument arrive at Goddard! Stefanie M: Excellent question! My favorite part of this project is the ground-breaking science that only JWST will be able to provide to date! In Solar System science for example, amazing new discoveries will be made in determining the composition of asteroids and comets. Stephanie H: The people! There are so many amazing people that work on this project. Everyone has an important role in the success of JWST; Scientists, Engineers, Project Managers and all types of Project Support. Tracy: I'm fascinated by the testing process, how each piece is so carefully and -- I guess ruthlessly -- tested, how elements of the telescope are exposed to incredible temperatures and stresses, to ensure that it functions in orbit. Desiree: My favorite part of the project is the variety of work I get to do. Since I photograph the entire project, I get to learn a bit about each instrument - I love having something different to do everyday! Nikki: I would have to say that my favorite part of this project would have to be the science. JWST's mission is to find the first galaxies that formed in the early universe, connecting the Big Bang Theory to the Milky Way Galaxy. Determining how galaxies, including gas, stars, and metals evolved to the present day is intriguing. Having the opportunity to contribute, and to be a part of this discovery is a big deal! Allison: The amazing mirrors! If the full Primary Mirror were expanded to the width of the United States, there would be no mountain higher than 2 inches! That's pretty smooth! Then we need to be able to move them around 5 nanometers at a time (1 nanometer is one BILLIONTH of a meter). All the technology necessary to build a telescope of this size to operate at 40 Kelvin is pretty fantastic. A: Allison: When the tornados came through Huntsville a few years ago we had 6 mirrors in optical test down at cryogenic (40K) temperatures. The power was out, roads were closed, but we kept testing on the back-up generators. Food was peanut butter only until we found a restaurant an hour away that was still open. Desiree: My first day at Goddard was the day that the first shipment of mirrors were inspected. I remember standing in the viewing window watching the inspections. A few months later, I was standing in the clean room within a few feet of the mirrors photographing them! I still have to pinch myself sometimes to remind myself that this is real and that I am part of history! Marcia: JWST will be launched in 2018 [Editor's Note: launch currently scheduled for 2021]. Both my husband and I were selected by NASA HQ to work on the Project (we had expected only one of us would be chosen), and we looked at each other and said, "We need someone to clean our house and take care of the pool!!" A: Amy: Understanding the complexity of the observatory! This is not only a big telescope, but it has many parts, subsystems, and units. As part of the Observatory System Engineering team, I need to have a working understanding of the observatory. That's been the biggest challenge so far. Marcia: For NIRCam [JWST's Near Infrared Camera] the challenges were a combination of developing a design with exquisite optical performance while working in a very constrained budget environment. Allison: There have been many exciting challenges to solve on JWST, from making mirrors light enough to launch, yet able to maintain their precise shape and position during all that shaking on the rocket to finding electronics that can operate at 40 Kelvin in radiation. Julie: A very interesting challenge of working on JWST has to do with the size of the team. We have people from all over the US, Canada and Europe working together. The amount of collaboration to do ANYTHING is huge. They don't teach you this in engineering classes. Nikki: I will have to agree with Julie. A very interesting challenge of working on JWST has to do with the size of the team, interacting with my team, our partners, and internal support service team members and ensuring that all stay within budget, and have adequate funding to support the necessary efforts can sometimes bring about a challenge because as we all knowâ€¦things do not always go as planned. Pam: JWST will launch in 2018 [Editor's Note: launch currently scheduled for 2021]. As the financial analyst on JWST, I am responsible for all aspects of funding with regard to our prime contractor Northrop Grumman. The funding for the JWST is both challenging and overwhelming. However, the rewards outweigh the challenges. The challenges include performing historical trend and cost/schedule performance analysis. However, the challenges are fueled by excitement. Trend and cost/schedule analysis gives a chronological timeline for the life cycle of the telescope. The timeline includes, concept, design & fabrication, integration & testing and will continue with operation & sustainment. During each one of these phases, I have met many of the individuals that make it all happen from beginning to end. They included scientist, engineers, technicians and other analyst. I travel to various locations and have seen firsthand the individual parts of the telescope such as the mirrors and backplane that will eventually be integrated into the finished product. Although it is challenging, it is also very rewarding. Desiree: The acronyms!!! There are so many acronyms within Goddard and specifically within JWST. Also, because I came from a background that was more art and marketing oriented than science oriented, I am constantly asking questions and learning from engineers and other colleagues. Maggie: Being on a high-profile project with a lot of scrutiny can be stressful. A: Maggie: I love working at NASA. I can't imagine working anywhere else. NASA Goddard has a very collegiate environment, and it's really exciting seeing missions like JWST come together right in front of our eyes. I never get tired of seeing what's going on in our clean room. Nikki: I love working at NASA. NASA GSFC has a great positive working environment and a great organizational culture. NASA is an incredible place to work. I get to work on some very exciting and interesting things, like James Webb! Stephanie H: Working for NASA has been a great experience! Goddard in particular has a community style atmosphere. Everyone is working toward a common goal which makes you feel that you are a part of something bigger. Amber: In 2012, NASA was voted as the best place to work in the Federal government: http://www.nasa.gov/home/hqnews/2012/dec/HQ_12-433_Best_Places.html I agree; I love my job at NASA! Stefanie M: I love working for NASA. I grew up in Houston and was inspired from a very early age to work here from regular visits to Johnson Space Center. I have now worked for both NASA Ames Research Center and Goddard Space Flight Center. The working environment at both centers, from a scientist perspective, was great. I have found NASA to be very collegial and encouraging of interaction and collaboration beyond your immediate research group. Shannon: It's really a privilege. I love how unabashedly passionate folks are about what they do. It's also great to have a question about how something in the universe works, and then be able to just walk down the hall and find someone to answer it for me! Desiree: Working for NASA is amazing! There is such a great team atmosphere here, and everyone works together. You need each person to have everything work perfectly. For example, when an instrument is installed onto ISIM, there are engineers, technicians, quality engineers, safety engineers, contamination engineers and many others who take part. It's pretty incredible to see the number of individuals that it takes to perform a task! A: Tracy: Infrared light allows us to see the farthest objects in the universe, which also happen to be the earliest objects in the universe from our perspective. That's because the light from those objects began traveling toward our region of space billions of years ago. The light starts out as visible and ultraviolet light, but as it travels across the cosmos, it gets stretched by the expansion of the universe. That stretching changes, or "redshifts" it, into infrared light. Infrared light can also penetrate clouds of gas and dust, unlike visible light. That allows us to see through these objects to an extent, to warm objects like newly developing stars that are hidden inside. Finally, warm objects that don't really radiate in visible light can shine in infrared light. Think of using an infrared camera to find someone at night in the dark. Marcia: Another benefit of observing in the infrared is that these are the wavelengths where molecules in the atmospheres of exoplanets have the largest number of features. jaLissajous: Because of the absorption lines from that planet's star as it passes through said atmosphere? Marcia: Exactly -- by taking a spectrum of the star alone, of the star + planet and then differencing you will be able see the absorptions. We may see water, methane, carbon dioxide, and carbon monoxide for example. Christine: At visual wavelengths, the planetary atmosphere is characterized by looking at primary transits when the star passes behind the planet. In this case, we're looking at star light that passes through the planet's atmosphere and imprints absorption features. The situation is slightly different in the infrared in which measurements of the planet and star emission are compared with measurements of the star alone. This allows astronomers to measured the emission spectrum of the planet and to search for the molecular features that Marcia spoke of. A: Amy: JWST is designed for 5 years of life with a goal of 10 years. The primary consumable is propellant, because the L2 orbit requires adjustment. Amber: If we get an efficient launch, we could go beyond 10 years as well. A: Allison: I think very young girls are naturally interested in science as they learn about and explore their environment. The key is retaining that interest and seeing science and engineering as a viable and desirable career track. It is important to work to eliminate the message that girls are not good at math - this is an untrue, but pervasive stereotype in our society. Additionally, girls are often more socially aware than boys - it is important to re-frame the perception of the social competence (or lack there-of) of scientists and engineers. Finally, studies show that girls are most likely to want to pursue careers where they can help people - science and engineering certainly helps us in our every-day lives, but not many in the public see that direct link - we need to better promote this aspect of the fields. Julie: Alison's advice is great. Girls like to get involved when they feel included and accepted. Having women role models who are positive and approachable, not scary and clinical, is key. Christine: I think that it's important not only to get young girls more interested in science and engineering but also to make sure that they have the appropriate technical foundations to succeed in these careers if they choose to pursue them. I worry that students do get excited about careers in science and engineering but that they can not turn that excitement into long term career paths because they do not have the math, computer skills or science background when entering college so they get frustrated and choose something else. A: Amy: The good part is, when you're in a clean room, it's usually because you're working on hardware, which is hands on and I enjoy that. The funny part, at least for me, is the gowning. The gowns and shoe covers are always too big, so I usually end up looking like a clown. And you have to put your shoes through a cleaner which are basically fast whirring brushes. It's so powerful that it's taken my shoes off and shot it across the room a few times. Desiree: You really have to plan your days when you are going to be in the clean room - forget about having your hair look good after a few hours in the clean room! It is also really cold since the air is constantly moving so you need to plan your outfits so you stay warm in the bunny suit (especially if you are in there for several hours) Also, many items are not allowed in the clean room because of contamination that you wouldn't realize. They have special clean room paper that they use and you cannot bring in cell phones. Essentially, you are cut off from the outside world a bit. So when you get back to your desk, you have many emails to respond to! Julie: Working in the cleanroom means a break from hayfever.... it is nice to escape from ragweed and dust for a while! When in the cleanroom it is amazing to be up close with the hardware (not too close, we have contamination, damage and ESD precautions). The hardware looks cooler in person - more complicated and delicate - than it does in pictures. The amount work "hands-on" work that goes into building a one-of-a-kind piece of flight hardware is unbelievable. The hands-on technician work that occurs at GSFC is world class. This may not be advertized much. It takes years for someone to become skilled to work around and on the hardware we have. JWST would not be built without our incredibly talented technicians! A: Amber: Welcome to all of you, and what great questions! As an astronomer that studies distant galaxies, one of the most exciting things for me about JWST is that it will see so far into space (and therefore back in time)...all the way back to the very first galaxies that were born after the Big Bang! We will be seeing light that has literally traveled for over 13 billion years to our telescope. Marcia: JWST will be able to see almost all the way back to the Big Bang --a distance of about 13 billion light years! JWST will be able to study other solar systems by a technique called "transits" where we will record eclipses of the parent star by its planets. These eclipses will let us measure what's in the planet's atmosphere. JWST's mirror is about 20 feet across while the sun shade is as big as a tennis court. JWST won't be able to take video in the traditional sense but will be able to make movies by time lapse photography (take individual photos and assemble in time order. JWST may be able to infer the mass of other planets but this measurement is best done using very accurate spectrographs on ground based telescopes. Christine: JWST will be able to observe other planetary system by (1) taking pictures of planets next to their parent star using coronagraphs and (2) looking for dips in the light from a host star as a planet passes in front of it (transits). Ground-based telescopes will be needed to measure the mass of the planets using the radial velocity technique (a stellar wobble produced by the gravitational tug of a planet); however, JWST will be able to measure the spectra of planet's atmosphere. Tracy: Hi, Glen Burnie teacher and students! I live in Glen Burnie -- nice to see you here! Webb won't have a video camera, but the types of objects it looks at usually won't change quickly enough for video to be very interesting. Webb is pretty big -- we once figured out you could park about six cars on its sunshield. Allison: I'm so glad you and your students are following this Q&A! The summer before 5th grade I went to a public start talk at Mt. Rainier National Park and decided then that I wanted to go into astrophysics! A: Marcia: For NIRCam we had a variety of shops do our machining. The University of Arizona's machine shop did a great job on titanium and molybdenum parts. AXSYS in Alabama produced our beryllium benches (and the telescope's mirrors). And guess what, we don't have any aluminum in NIRCam (but MIRI and FGS do). TIGit: Hello Marcia, thank you so much for the reply! I am so happy to hear about the work you guys do. It's fascinating. Beryllium benches? What do they do? I've only ever heard of beryllium, and it's always been "don't mess with it, it'll kill ya!" Why is it used for the benches? What do the benches do? No aluminum! Oh my heart! Haha, well that's an eye opener for me. My factory makes aerospace aluminum, my boss always cheers us up with "Just think about this, this stuff is gonna be in space!" But I suppose the coworkers and I already knew our stuff is mostly for Boeing. Marcia: They are two other instruments on JWST. MIRI is a mid-infrared camera and spectrograph working at wavelengths about ~20x visible light. FGS (Fine Guidance Sensor) tracks the position of a star and tweaks up the telescope's pointing. Allison: You're right to be wary of Beryllium! It can be toxic if inhaled. Beryllium is a critical material for use on JWST because it is very stable at cryogenic temperatures. As you know, all materials change shape over large temperature swings. We need to know that critical alignment and optical performance remains stable throughout the JWST mission. Beryllium does this very well down at 40 Kelvin and therefore it is used both in the science cameras and for all of the mirrors in the telescope. (It isn't so stable at room temperature, though, so we have to control thermal gradients in the test chambers very carefully to measure the performance when not at cryogenic temperatures). Beryllium is also very strong and light. For example, we are able to remove over 90% of the material in the mirrors and still keep stable optical performance through launch vibration. Amy: Yes, we do some of our own manufacturing and machining here at Northrop. The spacecraft and sunshield are mostly made of carbon based composite. The metallic parts are mostly aluminum and titanium. We mainly use them on joints and hinges. Thanks for replying! Glad to hear from you Amy. Joints and hinges? That's cool. And necessary I guess. Aluminum wouldn't do well re-entering the atmosphere on the outside of spacecraft. Thanks for responding, I'm just a young machinist working for an aluminum company that provides you guys with aerospace alloys, but it's my dream to actually machine and/or weld the parts for space-things. Do your machinists have to also be engineers? I'm thinking about going to college, but the math aspect is psyching me out. Amy: Our machinists do not have to be engineers as well, but they do need certification. I highly recommend going to college, but on the job training is also good qualifications. You need to be familiar with engineering drawings, GD&T, and CAD/CATIA capability are a great plus. I would recommend looking on our careers website for what we look for in machinists. Julie: Goddard has an entire staff dedicated to advanced manufacturing. Talented and experienced machinist are hard to find and I hope that you find this to be a rewarding career. You do not need a college degree to be a machinist at Goddard. To succeed, you need motivation and dedication and networking. The parts we build are usually very specialized and have all kinds of stringent tolerances and specifications. Sometimes the engineers that are designing the parts do not understand as much about the capability and limitations of the tools and materials as the machinist. To be a great machinist at Goddard, you need to become an expert in your trade and work closely with the designer to help them take a component from a concept to a reality. A: Shannon: One of the cooler things about working Legislative Affairs for NASA is that NASA has broad and bipartisan support from Congress. Most Members of Congress and their staff are generally aware that the research and exploration we do in space benefits us here on Earth. Part of my job is making that connection for Members for specific missions like JWST-via briefings, cleanroom tours, etc. So we are working hard to spread the word, and many Members of Congress have taken a very active role in making sure that the mission's development is progressing well. A: Maggie: It might depend what you want to do. I know researchers in earth science who have BS or MS degrees, but most of the astrophysics researchers I know have PhDs. We have scientific programmers at Goddard who range from BS to PhD degrees. And I also know engineers that range from BS to PhD degrees. Personally, I have a BS in physics and astrophysics and when I graduated I sort of stumbled into education/outreach, which was a niche that worked well for me - translating the science we do and then communicating it to the public and to educators. Allison: Great question Astropie! I also have a B.S. in physics. With an interest in broad, rather than narrow topics and a desire to move quickly into an environment with more diversity, I opted to go straight into industry rather than on to graduate school as I had originally intended. I always look to hire people with physics backgrounds - a physics degree is great at teaching you how to think and problem solve. Systems engineering is a natural great fit for those with a physics background and nearly all the system engineers on JWST here at Ball Aerospace studied physics in school. Marcia: First, one does not need a master's or higher to work for NASA or in the astronomy field. My words of wisdom for picking a graduate school are along these lines. If you know what areas(s) are most interesting to you, research those schools and and try for them. For example, Arizona is great for optical and infrared astronomy but we don't have any solar astronomers (check out Stanford or Colorado for that!). If you get accepted to several schools that have programs in areas you find interesting, it is also OK to pick a school where other attributes are attractive (eg. Arizona is great if you like hiking but not so good for going to a beach). Amber: Glad to hear that you got to visit Goddard! I got my Ph.D. at Arizona State, where I could get my degree in Physics, but still do astrophysics research (which is what I was looking for). My top piece of advice for anyone looking at grad schools is to TALK to the current grad students. That way, you will learn about what the department is really like! Also, if you know what particular area of research you are interested in, look for a place with faculty that do that line of research. Your grad school advisor will be critical to your success, so look for someone with a robust current group of students and postdocs, who seem reasonably happy with their experience. Grad school is hard, but it can be very rewarding, and in the end you (hopefully) get a job that you love! Stefanie M: Hi astropie! I want to encourage you to pursue graduate school and wish you the best of luck. Don't be discouraged from taking classes (if time allows) outside of your directed study. Being well-rounded and versatile helps you think outside of the box and will also benefit you when new opportunities arise for something just beyond your scope of expertise. Once you select a program I encourage you to pursue fellowship opportunities with NASA. Some are listed here. Hopefully you got to see the many other amazing things going on here at GSFC as well! A: Amy: I hope they let me in the control room! happinesswins: Amy, I hope you are there, too! What is it that a JWST Alignments Thread Lead for Northrup Grumman does? Amy: That's a good question... my job is to basically ensure that sensitive parts of the observatory is in alignment. I have a team working with me, and our responsibility is mostly with the sunshield and the spacecraft. For example, there are a lot of pieces that go into building the sunshield. We set requirements on how precisely these pieces have to be built, how accurately they have to be installed, and we define the test and measurements that tells us where they finally got installed to. In a nutshell, we make sure things go where they're supposed to be on orbit. happinesswins: was just marveling as to how impeccably the totality of alignment must take place, everything in its perfection as a whole in order to work. Awesome competence a requirement... By sensitive parts of the observatory, what do you mean? It seems as if everything might be that. Except perhaps the frame is less? What parts are regarded as the spacecraft? Does your work involve the unfolding process of the telescope? Amy: Our team is responsible for the mechanical alignment, so the physical location of where something is. You're right, the sensitive parts are things like the star trackers, the reaction wheels, things that actually have a job to do. We do carefully place things like the frame or an electronic box, but they are not "aligned". And yes, I do get involved in the unfolding process, the deployment, in fact you can say that my job is to make sure everything is deployed to the right position. happinesswins: That is a big job. It is mindblowing precision. Deployment, how amazing to be responsible for the unfolding. That seems so very key and unprecedented...Will you and your team then be working on JWST until its final completion? Amy: Our team is part of the system engineering team, so we are more of the design and analysis people. There are is a separate group of very talented folks that take the measurements. We then analyze the measurements and test results. Our team is here through launch, and I hope to be able to work on JWST until it launches. Marcia: I hope to be in the Control Room where the images are first received! Stephanie H: I would love nothing more than to be at the Launch in South America in just five years. After that, we are unsure exactly how long it will take for JWST to reach its final destination (an estimate is around 10 weeks) but most of us will be transitioning into another up and coming project. It takes far less people involved in the capturing of the images then it does to assemble the telescope prior to launch. happinesswins: Yes. It's like icing on the cake I would think. How wonderful to be in South America watching Ariane take off with JWST. Do you have projects in mind already that you will be or wish to be a part of? Stephanie H: To be completely honest, I only started working with NASA six months ago and I am still in complete awe of the work we are doing on JWST. I haven't thought that far into the future however I do see good things happening for me! I don't know where I'll be when we receive our first images, but I'm sure I'll be excited to share them with the public! Stefanie M: Webb will be launched in 2018 [Editor's Note: launch currently scheduled for 2021] and takes about 2 months to reach its L2 orbit and cool to operating temperature. The first data will follow in the approximate 4 months of alignment, checkout, and calibration. This will be a very exciting time for everyone on the project. Then the REAL science begins and hopefully I'm helping with the analysis of these data from the start. happinesswins: How exciting. The fruition part. The looking and seeing. The 4 months of alignment, checkout and calibration - Will there be much experimentation at that point? Or is that already process already very well understood? Amy: The calibration and check out process is very well defined and understood. There will probably be some unexpected things, but we allocated time for that in the check out schedule. Christine: The great thing about a space telescope is that you can download the data from anywhere unlike a ground-based telescope where you might have to go to the telescope to collect the data. I could be anywhere when my science observations are executed... at work, at home, or on vacation with my family. happinesswins: That's a wonderful flexibility. Very neat. Once it begins its work, will you be giving JWST directions as to where it shall point its mirrors? Christine: Yes. I am a member of the MIRI Instrument Science Team. One of the perks of building an instrument on a space-based telescope is Guarenteed Telescope Time. Each Instrument team automatically has 900 hours of science time to carry out observations on everything from the formation of the first galaxies to that of the nearest exoplanets. I plan to observe planetary systems around other stars, the majority of which are younger than our own, to understand whether planetary systems form and evolve the same way around other stars as they did in our Solar System. In addition, I will also be among the hundreds of astronomers world wide who will request observations with JWST once the call for proposals is made. Nikki: I don’t know where I will be when the images are first received, but I will be super excited to see the first images! I may even email some members of our team during this time, with the subject lineâ€¦”JWST First Images- Yay!!”. happinesswins: "JWST First Images - Yay!!" We should put that on a poster of the first images. And I would say, "Thank-you JWST!" across the universe. Nikki, what do you do as Senior Resources Analyst for NASA Goddard? Nikki: I agree "JWST First Images - Yay!!" would be great to put on a poster depicting the first images! As Senior Resources Analyst for NASA GSFC, I am responsible for the budget execution work, along with various financial control activities, and cost accounting functions for James Webb. My responsibilities also include preparing budget estimates and justifications for James Webb. My primary focus is on the OTIS and Systems I&T efforts. OTIS is the integration of the Optical Telescope Element (OTE) and Integrated Science Instrument Module (ISIM). Funding for OTIS and Systems I&T supports the project's Ground Support Equipment (GSE) efforts which are being done by ITT Exelis of Rochester, N.Y., and the Chamber A testing efforts in Houston, which will take place at NASA's Johnson Space Center (JSC). ITT Exelis supports the project's GSE efforts in various phases. The COCOA, which stands for "Center of Curvature Optical Assembly, an important phase of the project's GSE efforts, was built by ITT Exelis with subcontractor Micro Instruments. The COCOA is part of NASA's vacuum cryo equipment that will be used at JSC to test the performance and temperatures of the mirrors. A fact that I find interesting is that the chamber at JSC, will be the largest cryo vacuum test chamber in the world!! I saw the Chamber in person during one of my visits to JSC, and large it is! In summary, as Sr. RA for NASA GSFC, I manage the funding activities that support the next great observatory, JWST! A: Amy: There are software and algorithm development roles on our engineering team. There are also analysis roles on our team that uses computer science, specifically, mathematical programming skills. One of the folks on my team is a Matlab whiz and he helps us with simulations of the spacecraft. No clearance are required to work on the JWST team. Some of us that work for defense contractors undergo background check prior to joining the company, and US citizenship is helpful. A: Allison: I am certain all of us experienced the low ratio you are noticing. My entire school was only ~20% female, with the physics department being even lower. And, of course, the stereotypes are always there, whether they are about the ability of women to pursue these fields or about the type of women who do succeed in a technical field. By this point in my career, I'm so used to the gender imbalance that I feel nearly as out of place in a room full of women as my male co-workers do and I rarely even notice when I'm the only woman in the room. I think you can probably tell by the comments in this Q&A that we all are passionate about what we do and love our choice of career path despite any gender imbalance/stereotypes we dealt with along the way. Anyway, my best advice is to remain strong in your understanding of yourself - you are the one who knows and decides what you want to do with your life and how best to feed your mind. We all approach and deal with prejudice differently. When I was in school and a young professional I chose to deal with the negative image of women in science by generally not bringing up what I do / what I studied until I had gotten to know someone - that way they got to know me as a person before any stereotypes came into play. I still consciously work, in all my interactions, to offer a counter-point to the stereotype of women in technical fields. This may not be the right approach for you, but it was the right approach for me. Dealing with stereotypes of women not being cognitively capable of pursuing technical fields is another issue all together. If you are perceiving this from your professors, I would talk with other women ahead of you at school on how they dealt with those professors and I would go see your dean of inclusion/equity regarding this matter. If you are feeling it from your fellow classmates, I would call them out on it (easier said than done!) and have done your research to cite examples of female scientists and reference to studies disproving these ideas. I would also choose to spend my time with a peer group that doesn't feel the need to degrade others! Also, don't believe what they may try to tell you about your social prospects and don't settle! There are so many fascinating careers in math and science and studies have shown that businesses are more successful when they have diverse workforce and management - different experiences and approaches to thinking about problems lead to better solutions. The only way we will reach further gender balance is for more smart, enthusiastic women like you to stick with it and pursue their passions! Maggie: It's really great to see that you are majoring in Physics and Math. It was my experience as well that there just weren't many females in my classes once I started getting into 400-level physics and math. I had two classes (Theoretical Mechanics 2 my last year of school and an E&M lab my first year of school) where I was the only girl. On the one hand, I didn't have a negative experience with it. I had a lot of friends who were guys (and I still do), and I never felt like I was treated differently for being female. (I know that's not everyone's story.) Like Allison, I almost don't even notice the gender imbalance anymore. On the other hand, it is troubling that so few women pursue science and math. I'm not sure if it's because they aren't encouraged early enough, or if they don't want to compete with boys when they are teens (or be perceived as a brain), or something else entirely. If it's the latter, I hope we can convince teenage girls that it's ok for them to be smart, it's ok to like science - and that not only is it ok, but that women can excel at these things. And also that you can be whatever kind of girl you want and pursue a career in a technical field. Because it's true. Though there is a gender imbalance, I do know all sorts of different women here at NASA with technical degrees and none of them fit into a stereotype. One of my friends, who has a PhD in astrophysics, loves Hello Kitty and scrapbooking, and running half marathons. Another friend, also with a PhD in astrophysics, excels in sports (and played semi-professionally). I have a BS in physics and astrophysics, and my hobby is playing in a rock band. All these women I know have hobbies as well as careers and they are smart, well-rounded people. If more girls know that women like this exist, maybe it would help them not be scared off from a career in science. I was lucky and had parents that taught me I could grow up to be anything I wanted and supported and encouraged me to go into science. I hope that more and more girls that get encouragement too. Christine: I'm sorry to hear that you are at a place where there is a negative view of women in math and science. I was an undergrad at Caltech and I remember that some of the more vicious male students would make comments about how the admissions standards were different for men and women. Anecdotally, I know of plenty women succeeded and went on to be leaders in their chosen fields and plenty of men who struggled. The only advice that I would have for you is (1) You spend so much time at your job that it is important to love what you do. If you love math and science, dont let those guys get you down. Know that not every place has a negative view of women. The culture of science is changing as more women become professional scientists and engineers but unfortunately change is slow. (2) Don't change yourself to accommodate them. I've met women faculty who felt that they had to be more macho than their male counterparts to be taken seriously. Do good work and you will be judged on the merit of your ideas and the quality of your work. Good luck!